Today, Finland’s Artificial Intelligence Accelerator (AIA) published a list of Finland’s top 15 AI companies. 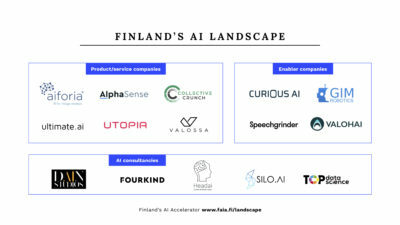 Out of 60 Finnish AI companies being strictly reviewed, only 15 were found to meet the criteria of a top-ranking provider of Artificial Intelligence solutions. The overview was categorised into 3 groups: Product/Service Companies, where Utopia honourably belongs, Enabler Companies and AI Consultancies. According to AIA, only companies that use real AI and have an international growth potential came to the list.